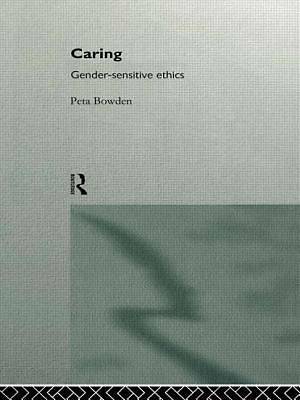 In Caring, Peta Bowden extends and challenges recent debates on feminist ethics. She takes issue with accounts of the ethics of care that focus on alleged principles of caring rather than analysing caring in practice. Caring, Bowden argues, must be understood by 'working through examples'. Following this approach, Bowden explores four main caring practices: mothering, friendship, nursing and citizenship. Her analysis of the differences and similarities in these practices - their varying degrees of intimacy and reciprocity, formality and informality, vulnerability and choice - reveals the practical complexity of the ethics of care. Caring recognizes that ethical practices constantly outrun the theories that attempt to explain them, and Bowden's unique approach provides major new insights into the nature of care without resorting to indiscriminate unitary models. It will be essential reading for all those interested in ethics, gender studies, nursing and the caring professions.